THIS IS A SPONSORED POST BY MICHAEL'S STORES. 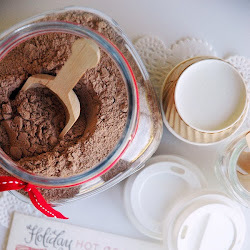 I ONLY SHARE PRODUCTS I'M EXCITED ABOUT + FEEL YOU WILL BE TOO! 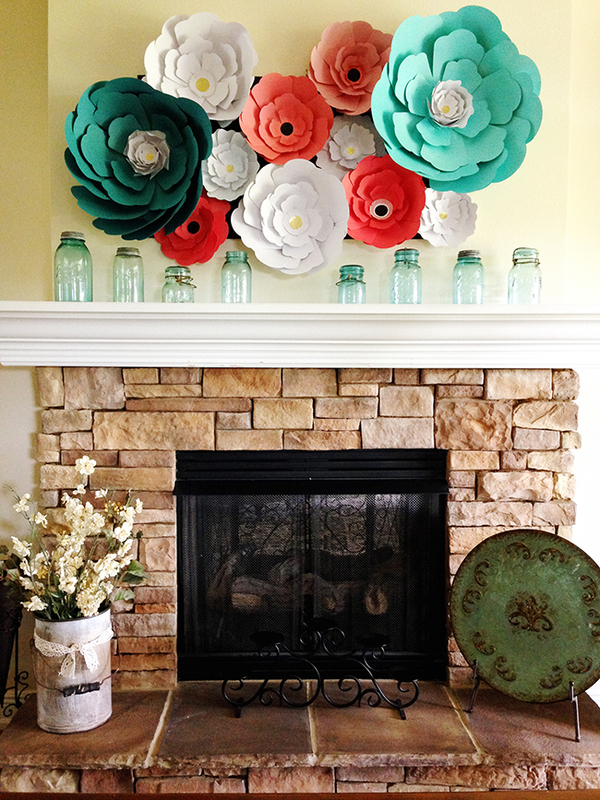 Thanks to the new Recollections Big Blooms Flower Kits, I now have a beautiful piece of art hanging above my mantle. It's really high impact and was easy to make. That giant display is hanging by one little nail - thanks to my brilliant idea to secure them all to a piece of foam board. By using the foam board as my base, besides the fact of only having to put one hole in my wall and avoid using adhesive strips altogether, I'm really excited to know I can move this art work anywhere I want to without a lot of hassle. It would look great in my entryway, hanging over Clara's bed, or displayed in the living room for a splash of color. But for now...it will remain in our dining room for us to admire over breakfast, lunch or dinner. 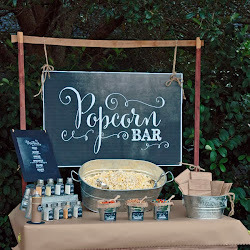 Of course, the party stylist in me knows how beautiful this would be for a dessert table backdrop. And for my mommy friends out there...I can also see this in a baby's nursery too!! 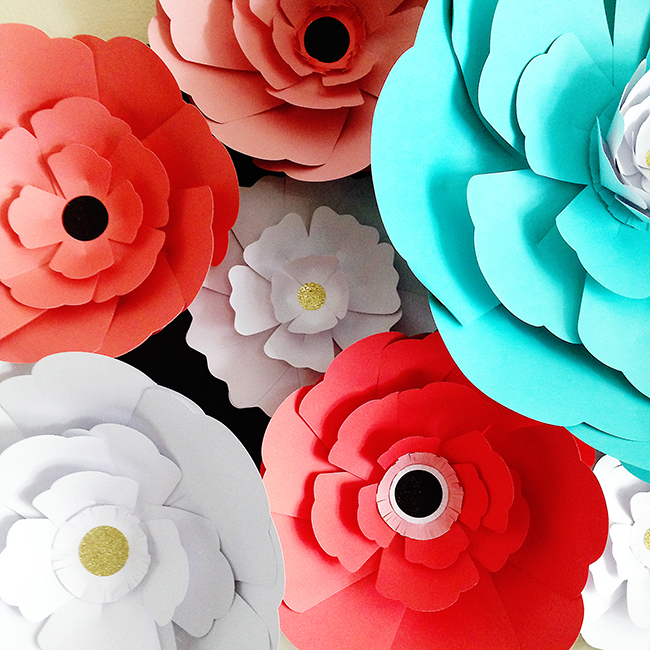 So let's get down to the nitty gritty of how to make these giant paper blooms!! 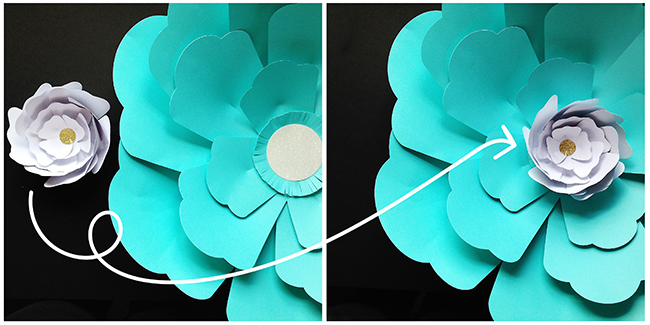 Hot Glue Gun - optional - a quicker option when doing a large amount of flowers. (caution: it's also more permanent too since it's not as forgiving as the double-sided adhesive). Pencil with eraser tip - optional - for curling tips of flowers before assembling as shown above and for securing petals quickly using the eraser tip - if you use a hot glue gun. Foam Board - optional - I used one to hot glue my flowers to so I could easily arrange the flowers and then quickly hang them all at one time. The foam board also allows me to easily move the art work to a different spot in my home when I want to change things up. I used black because I already had a leftover piece from a previous project. The Big Bloom Flower Kits are offered in four different sizes: 6", 11" 14" and 16"
I have to tell you...using the visual directions that came with the box left me sooooo confused. I was completely overthinking things as I was trying to follow the vague diagram without written instructions to accompany it. I tried several different ways of constructing the flowers and after about the 3rd or 4th attempt with lame results I finally realized it's all just a simple little trick. An easy little trick that shouldn't have left me so frustrated. Place double-stick adhesive, (or a blob of hot glue), on one of the two bottom flaps of the paper petal. I chose to use the right side to apply adhesive but it really makes no difference. You then lift the other petal flap, slide it over the top of the adhesive and push down to secure both petal flaps together. 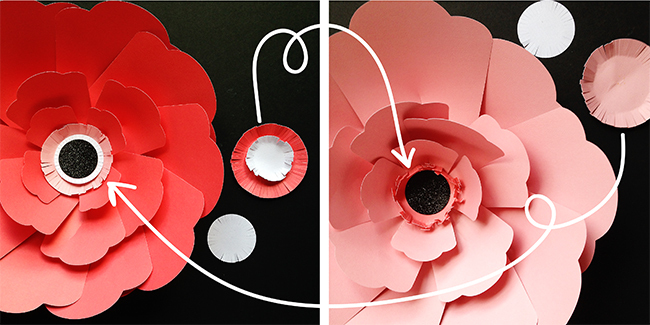 You control how much your petal will "cup" (and thereby create a more 3D flower) by how far over you slide the 2nd petal flap onto the adhesive. The less you slide it the more flat your petal which yields a flatter flower. TIP: I highly advise using the adhesive that comes in the kit prior to jumping straight to a glue gun. 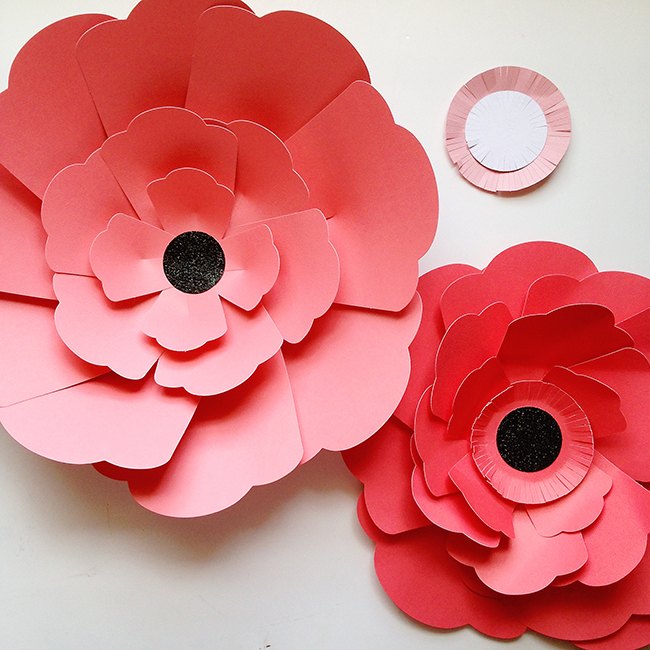 I found it helpful to practice the petal placement a couple of times and get a feel for the spacing of the paper petals. The tape adhesive allows you to reposition as necessary so your paper doesn't rip. HOWEVER - once I got the hang of things I got my glue gun out and never looked back because I had a lot of flowers to make. I also found the hot glue gun a better option for a permanent hold...especially on the larger blooms because they are essentially heavier. I had a couple of the larger flowers come undone after a couple of hours and I definitely didn't want that to happen after I had my masterpiece hanging on the wall. 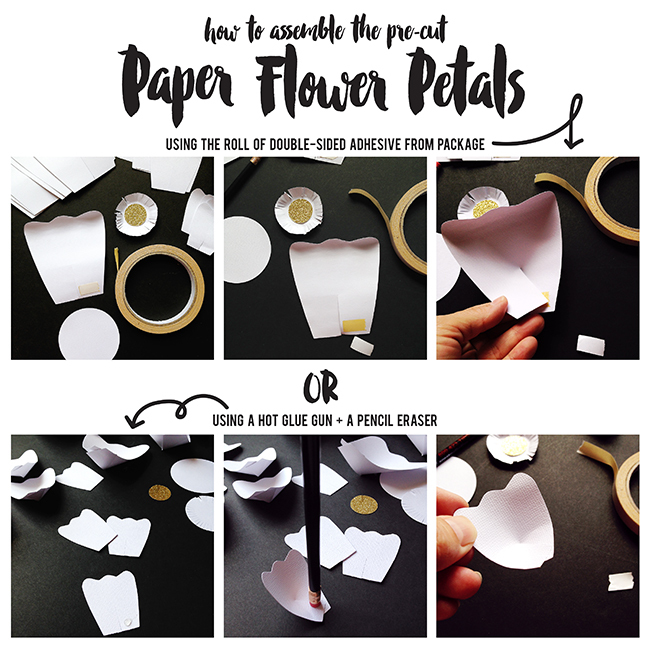 Once your paper petals are all made you will begin securing them to the edge of the large paper circle that came in the kit. Start with the 9 large petals first and overlap them one by one until you've completed a full circle and covered your large paper circle. 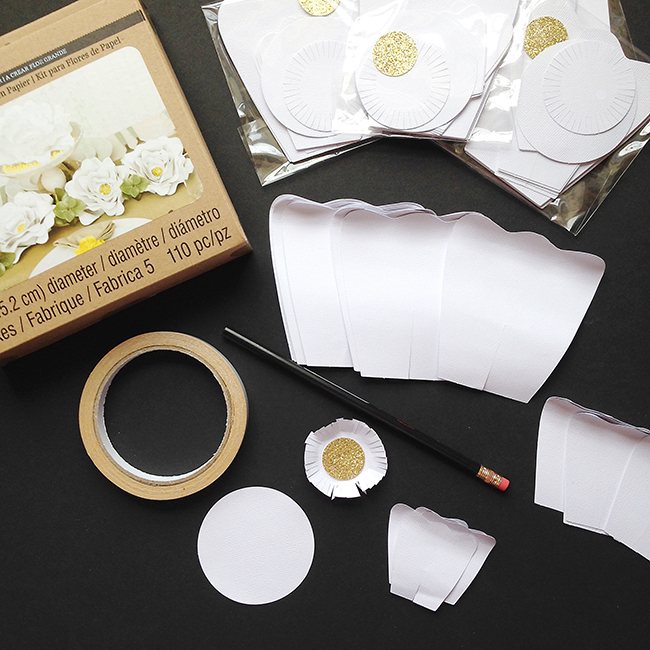 Tape or glue the 6 medium paper petals to the inside of the large paper petals - creating a 2nd layer inside the flower. 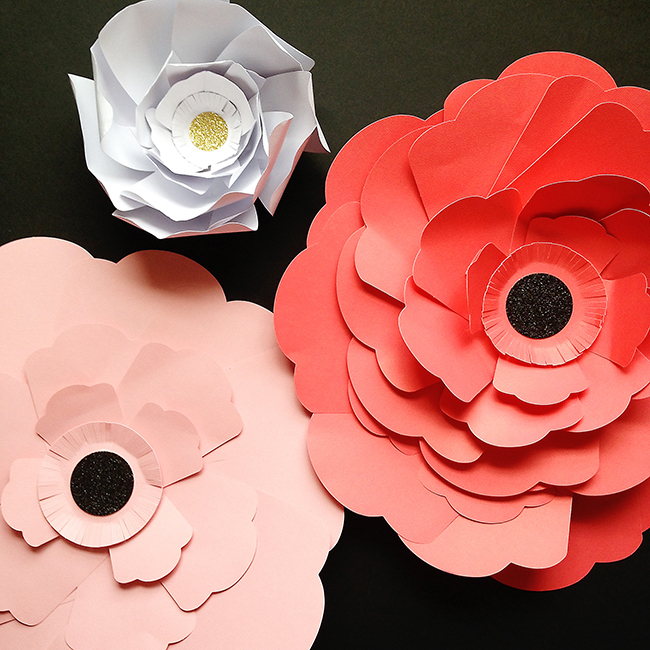 Finish with the 4 small paper petals and top off with the fringed and glitter centers. 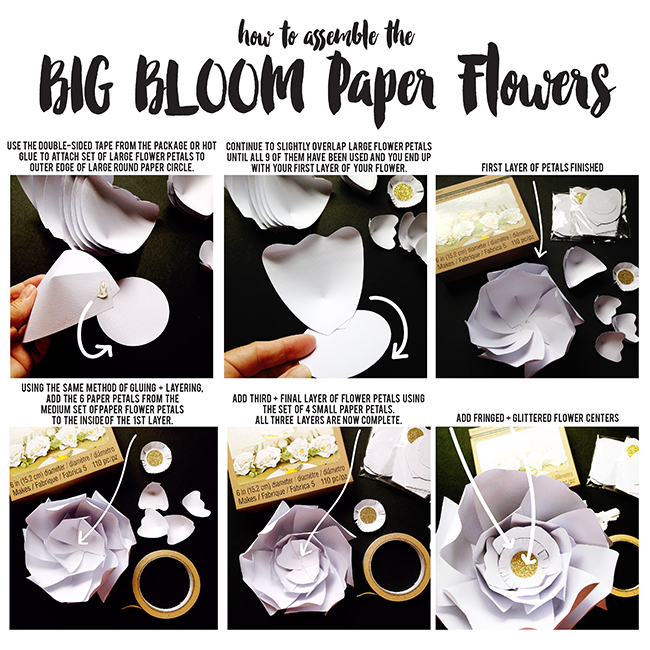 It's really that simple and once I got the hang of things, I was busting out beautiful paper flowers in a matter of minutes. I used the light pink fringe center on the dark pink flower and the dark pink on the light pink. LOVE! This was my favorite discovery!! I used the small 6" white flower as the center of the 16" blue flower. I really like the clean look of the flower on the left by simply leaving off the fringe center and only using the glitter circle. It's just another fun way to change up the look of the flowers. See how different these 3 flowers look? The difference is all in the overlapping...that's it. The white flower is the fullest flower with the most 3D effect. The petals were very overlapped in the creation process which created the deep cupping. I also curled the ends of the petals with a pencil prior to assembling them. The dark pink/coral flower on the right has a bit more dimension. The petals had less cupping and I didn't curl the petals on this one. The light pink flower is nearly flat with just a little bit of dimension on the small center petals - and again, no curling the petals on this one. I love how different they each look. Once I had my flowers made I put my foam board down on the ground and started playing around with the placement of each flower. Once I had the flowers in the exact position I felt would look good on my wall, I carefully added glue to the bottomside of each flower...one at a time...barely lifting them so as not to lose the positioning and throw off my whole arrangement and pressed them down onto the foam board. It took me all of 10 minutes to glue them all down and my art was hanging before the kiddos got home from school! Yes!! 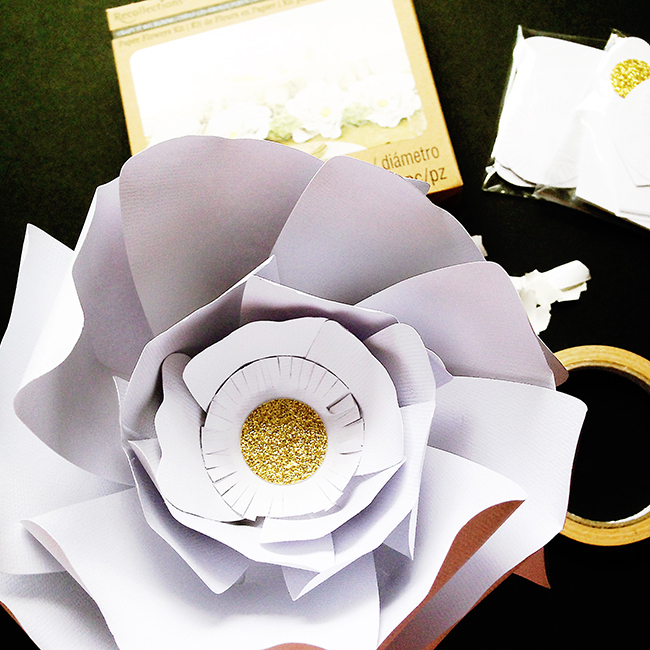 I love how simple these Big Bloom Flower Kits are. And since they are oversized they really help make a huge impact on your space with very little effort. I hope you'll try them out yourself!! 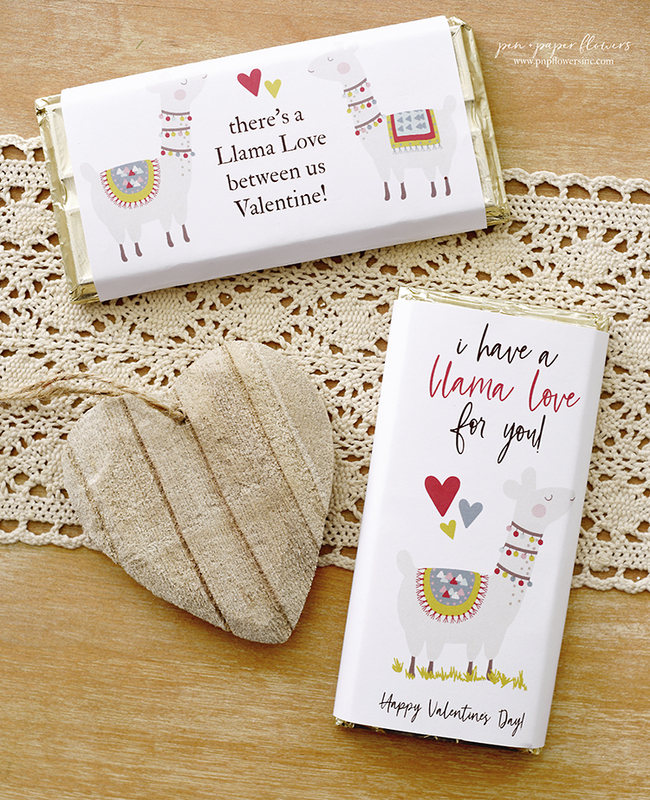 I know you are going to love them!! 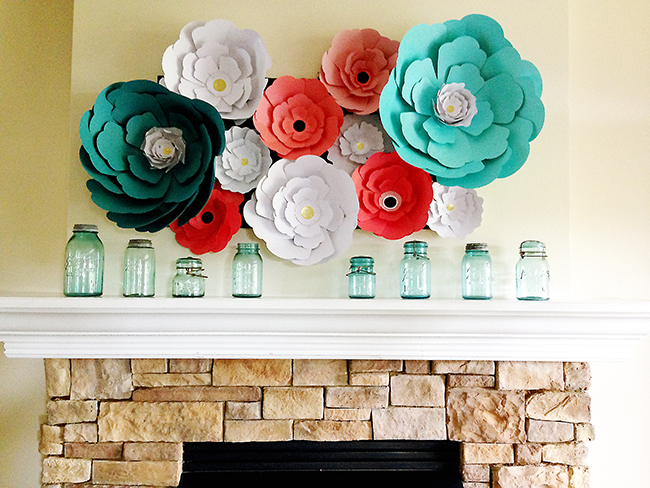 It took me longer to write this blog post than it did to create the flowers and hang it up. I love love love this!! What size foam board did you use? 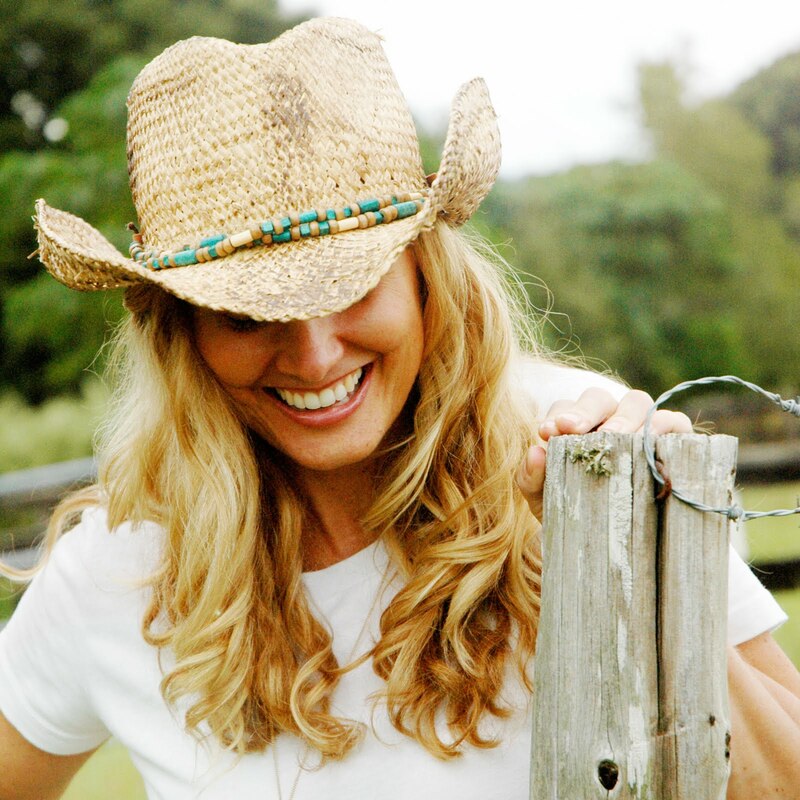 Thank you Krystian - I'm thrilled you love how the project turned out. I did a quick measure on the black foam board for you and came up with 42" long and about 20.5" tall. This was a scrap piece of foam board I already had prior to starting this project and worked great!! For the "Unknown" person who asked where to purchase the kit, these were once available at Michael's - July 2015. I have not seen them recently but I'm hoping they bring them back for Spring? They are really fun to work with!! I just bought several on clearance at my Michael's today.